The International Boundary and Water Commission, United States and Mexico (IBWC) have completed the Binational Study of the Transboundary San Pedro Aquifer. The study marks the first time researchers from both countries have collaborated to collect data and jointly prepare binational maps of the San Pedro River aquifer, which spans the border between the States of Arizona and Sonora near the communities of Sierra Vista, Arizona and Cananea, Sonora. The binational database and bilingual maps created for this study, and the resulting technical analysis, are an important contribution to scientists’ understanding of the aquifer. The report is the result of a dedicated group of scientists from both countries that worked with IBWC according to an IBWC-approved binational cooperative framework to allow them to exchange ideas and information to improve the state of knowledge in the basin. “The information included in this joint study improves our understanding of the San Pedro River transboundary aquifer and provides a more solid basis for decision making related to water management in both countries,” said Mexican Commissioner Roberto Salmon. The technical team for this study included personnel from the U.S. Geological Survey (USGS), Mexico’s National Water Commission (CONAGUA), and two state universities, the University of Arizona and the University of Sonora, working together under the auspices of the IBWC. Funding came from IBWC, USGS, CONAGUA, and the University of Arizona. 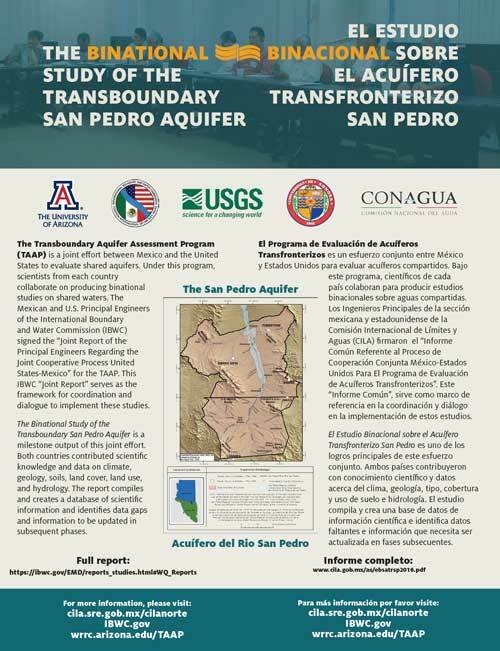 The 2017 TAAP-A/S Bulletin on the Binational Study of the Transboundary San Pedro Aquifer can be downloaded in .pdf format here. The 2013 TAAP-A/S Fact Sheet can be downloaded in .pdf format. The bilingual/bilingue Fact Sheet is here. TAAP-A/S (the transboundary Santa Cruz and San Pedro aquifers) is a federally funded program co-hosted between the USGS Arizona Water Science Center in Tucson, Arizona and the Water Resources Research Center (WRRC) at the University of Arizona. The program originates from U.S. Public Law 109-448, signed by the President on December 22, 2006 as the Transboundary Aquifer Assessment Act. The Act applies to the states of Texas, New Mexico, and Arizona where four transboundary aquifers have been designated for priority assessment; those being the Hueco Bolson and Mesilla Basin aquifers in the greater El Paso / Ciudad Juárez region, and the Santa Cruz and San Pedro aquifers across the Arizona – Sonora border (see map). TAAP-A/S is designated to operate for 10 years, with $50 million authorized for appropriation over that time period. Aside from the USGS, WRRC and Udall Center for Studies in Public Policy at the University of Arizona, a variety of other U.S. and Mexican stakeholders participate in priority setting for the assessment process. TAAP-A/S has been designated a case study by the UNESCO Internationally Shared Aquifer Resource Management (ISARM) program. The upper San Pedro and Santa Cruz river basins, south to north drainages which are bisected by the international border, harbor unique human-environment issues. The upper Santa Cruz is marked by the sister cities of Nogales, Arizona and Nogales, Sonora with the Mexican side having an approximate population 10-times that of its northern neighbor. Within the upper San Pedro basin, the cities of Cananea, Sonora and Sierra Vista, Arizona are the urban centers in which the majority of the regional population resides. Economic activity in Cananea is driven by copper mining while the U.S. Army’s Fort Huachuca is a major source of employment for residents of Sierra Vista. Federally mandated sustainability within the Sierra Vista Subwatershed is a driver for regional water conservation efforts. Callegary, J.B., Megdal, S.B., Tapia Villaseñor, E.M., Petersen-Perlman, J.D., Minjárez Sosa, I., Monreal, R., Gray, F., Grijalva Noriega, F., 2018, Findings and lessons learned from the assessment of the Mexico-United States transboundary San Pedro and Santa Cruz aquifers: The utility of social science in applied hydrologic research. Journal of Hydrology: Regional Studies. Callegary, J.B., Minjárez Sosa, I., Tapia Villaseñor, E.M., dos Santos, P., Monreal Saavedra, R., Grijalva Noriega, F.J., Huth, A.K., Gray, F., Scott, C.A., Megdal, S.B., Oroz Ramos, L.A., Rangel Medina, M., Leenhouts, J.M., 2016, Binational Study of the Transboundary San Pedro Aquifer: International Boundary and Water Commission. Binational Border Water Resources Summit: Past, Present and Future. Ciudad Juarez, Chihuahua, Mexico and El Paso, Texas, USA; September 28-29, 2012. Aside from the above presentation, the paper written for this conference can also be downloaded, either in English or Spanish. Arizona Hydrological Society Symposium- Dryland Hydrology: Global Challenges, Local Solutions: Tucson, Arizona; September 3, 2010. World Water Week- Responding to Global Changes: Accessing Water for the Common Good, with Special Focus on Transboundary Waters: Stockholm, Sweden; August 20, 2009. Sharon Megdal- The U.S.-Mexico Transboundary Aquifer Assessment Program: The Arizona-Sonora Portion as a Case Study. Christopher Scott- Building Shared Vision: Assessment of Transboundary Aquifers along the United States – Mexico Border. TAAP-A/S has compiled two databases of published materials related to groundwater in the binational upper Santa Cruz and San Pedro basins. These databases are available for download in both Adobe Acrobat PDF and MS Excel format, though due to character input limits, certain fields in the Excel version will be incomplete. The TAAP-A/S database is currently in draft format, and certain fields have not been completely reviewed. The files are being made available in draft format. For reference purposes, please cite as: Santa Cruz (or San Pedro) Database, Transboundary Aquifer Assessment Program- Arizona/Sonora. University of Arizona, 2010. Include the date that file was accessed and web address. On June 20, 2017 TAAP-A/S hosted a forum entitled "The Binational Study of the Transboundary San Pedro Aquifer: Results and Future Directions" in Sierra Vista. The purpose of the event was to share results from the Binational Aquifer Study of the San Pedro Aquifer and to discuss future directions for studying the aquifer. Presentations were given on the TAAP, the challenges and efforts associated with developing a binational study, and the results of the binational study. The forum agenda contains links to all presentations made. On November 3 and 4, 2009 TAAP-A/S hosted a workshop entitled “Developing a Work plan for the Santa Cruz and San Pedro Aquifers”. The purpose of this event was to review progress of TAAP-A/S and confirm or modify priorities in the draft work plan that will guide assessment of the Santa Cruz and San Pedro aquifers. Over 50 participants gathered during the two-day event, which culminated in breakout groups providing feedback on the TAAP-A/S work plan for priority assessment activities. The workshop agenda contains links to all presentations made. 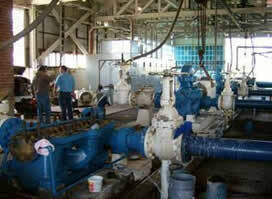 Municipal provision of groundwater to Cananea, Sonora requires pumping facilities to push the water uphill from the well field on the San Pedro River to the urban area. 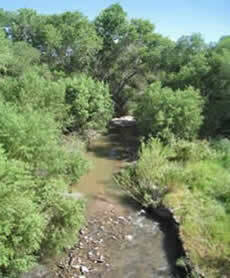 Surface flow of the Santa Cruz River at the Tubac Bridge is largely composed of treated effluent released by the Nogales International Wastewater Treatment Plant, located approximately 20 kilometers upstream, to the south.